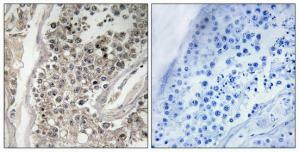 Immunohistochemistry analysis of paraffin-embedded human testis tissue, using RAB3GAP1 Antibody. The picture on the right is treated with the synthesized peptide. Western blot analysis of extracts from 293 cells, using RAB3GAP1 Antibody. The lane on the right is treated with the synthesized peptide. 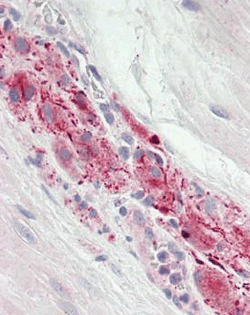 Immunhistochemistry analysis in human prostate / nerve (Formalin-fixed, Paraffin-embedded) using RAB3GAP1 / RAB3GAP antibody Cat.-No. 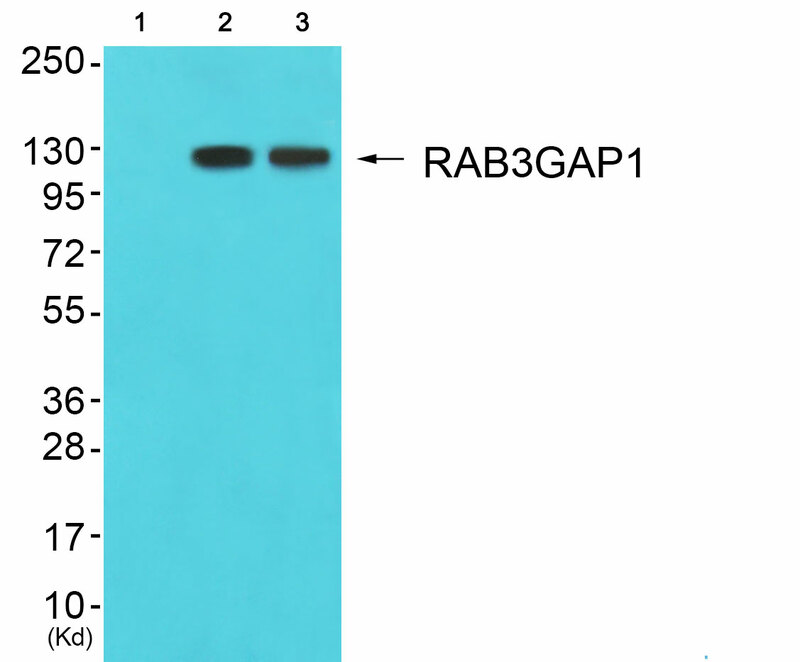 AP32329PU-N.
Western blot analysis of extracts from 293 cells using RAB3GAP1 / RAB3GAP antibody Cat.-No. AP32329PU-N. The lane on the right is treated with the synthesized peptide. 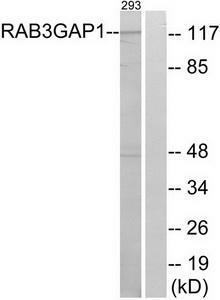 Western blot analysis of RAB3GAP1 expression in HeLa (A); SP2/0 (B); PC12 (C) whole cell lysates. Western blot analysis of extracts from 293 cells, using RAB3GAP1 antibody.The lane on the right is treated with the synthesized peptide. Western blot analysis of extracts from JK cells (Lane 2) and 293 cells (Lane 3), using RAB3GAP1 Antibody. The lane on the left is treated with synthesized peptide. Immunohistochemistry analysis of paraffin-embedded human testis tissue using RAB3GAP1 antibody.The picture on the right is treated with the synthesized peptide.